Two of our North-East homes, Archers Court and Archers Park are situated right over the road from one another, making it easy for Archers Court to head across and meet their neighbours! Some of the wonderful people at Archers Court made the “long” journey, across the car park to visit the equally as wonderful people at Archers Park. 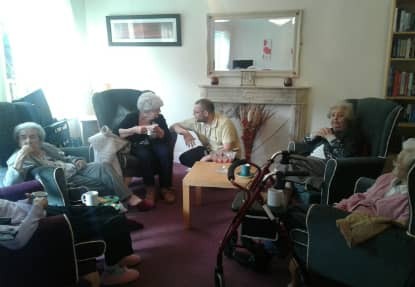 Residents from both homes had a great opportunity for a chit-chat over hot drinks and biscuits. They discussed mutual interests, activities they have done at their respective homes and trips they’ve been on and enjoyed. “It’s important that our residents meet new people outside of their own home, even if that means just going across the road, it’s still such an important part of their care”. Explained Julie Royal, the Activities Co-Ordinator at Archers Court.